I also realized after the nose blowing and sneezing and extreme eye watering began, that I was producing way too much bodily fluid to present myself at our annual extended family Christmas Eve gathering, so I sent along Andrew and Julia, and I stayed home, mucous running EVERYWHERE, and eating soup and watching holiday romance movies on Netflix. Julia looked at me with a mixture of disgust and pity and said, Mama I love you but you are disgusting. Christmas Day, I coasted along pretty well with the help of Bendryl to dry up my nose a bit. I had made our side dishes for dinner earlier in the week, so all we had to do for dinner was open up the oven and put them in, along with the ham. Easy peasy. Then the day after Christmas I got even sicker, and spent the next 2 days on our sofa with several blankets and all of the pets. Twasn't the flu. But twas the WORST COLD I EVER HAVE HAD IN MY LIFE and I've had some lovely and juicy colds in my day. And here we are, New Years Day I'm writing this, and I'm better but still hacking up bits of phlegm. Let's move from phlegm to cookies. 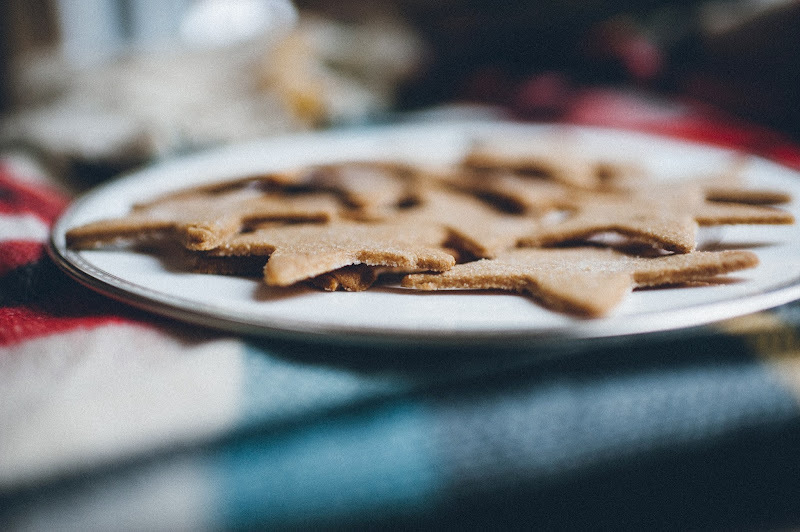 So yes, I do realize that Christmas is now over, but if you are like me, you maybe didn't get to all the holiday baking you might have wanted to do. Today for example, I made gingerbread, which I had meant to do two weeks ago. 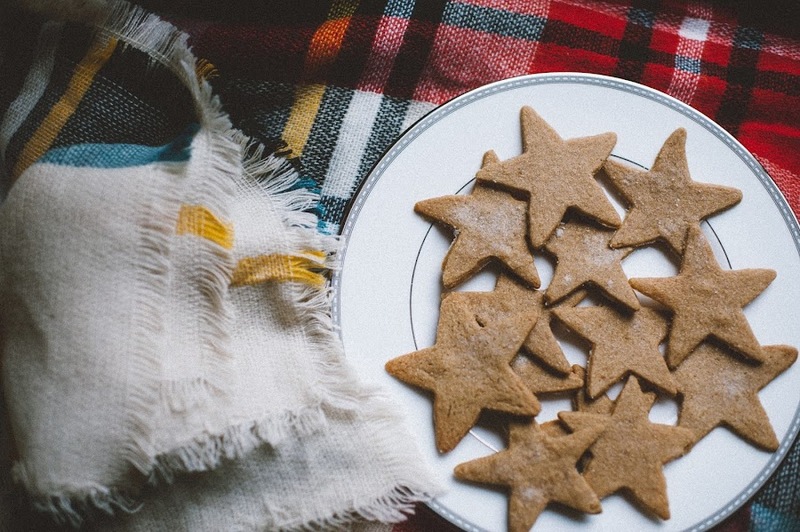 But here's the thing - IT'S OK to make these cookies now, because they are perfect for wintertime. 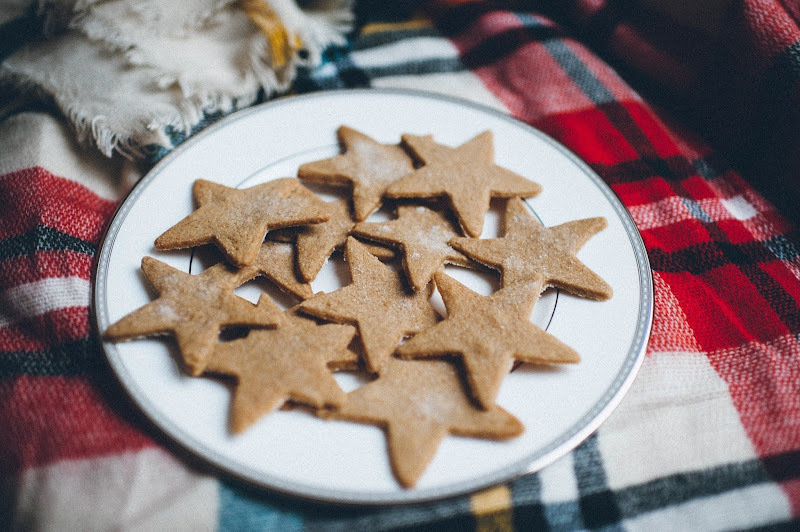 I would argue that these cookies are actually maybe too rustic and plain for the Christmas-time ball, and that they are actually more suited to be eaten with a blanket in front of a fire, or with a cup of tea and a book. And it's a good thing they are so light and crisp, because you will want to eat several at a time, several times a day. These cookies just FLEW into my mouth. They come from one of my all time favorite cookbooks, the 'Crabtree & Evelyn Cookbook', which I have mentioned many many many times on the blog. It's got loads of darling photos and really interesting recipes and I just adore it. If you love beautiful cookbooks that you like flipping through over and over, this is the one for you. I've had it since my mid-twenties and I love it as much now as I did the day I bought it. I hope you have some time this winter to make these little stars and that they brighten your day as much as they did ours. They are such.....nice little cookies. Whisk flour, cinnamon, and salt together in a small bowl. In a large mixing bowl, cream butter and brown sugar together until light and fluffy (about 3 minutes). Add egg yolk and beat until light. Add flour mixture and blend well. Cover and chill cookie dough in refrigerator for at least 1 hour or overnight. Divide dough in half. On a lightly floured surface, roll out half of dough 1/8 inch thick. 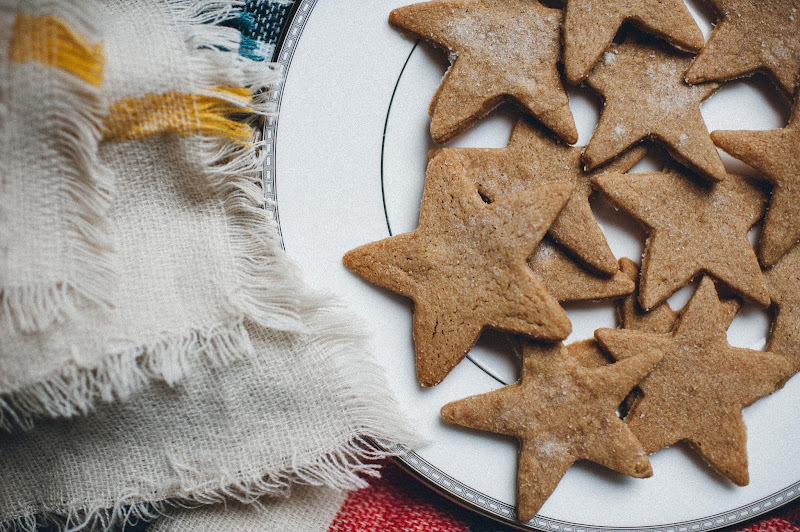 Using a 2 1/2-inch star shaped cookie cutter, cut out cookies and place them 2 inches apart on a lightly greased baking sheet (or a sheet lined with parchment paper). Roll out second half of dough and arrange on baking sheet. 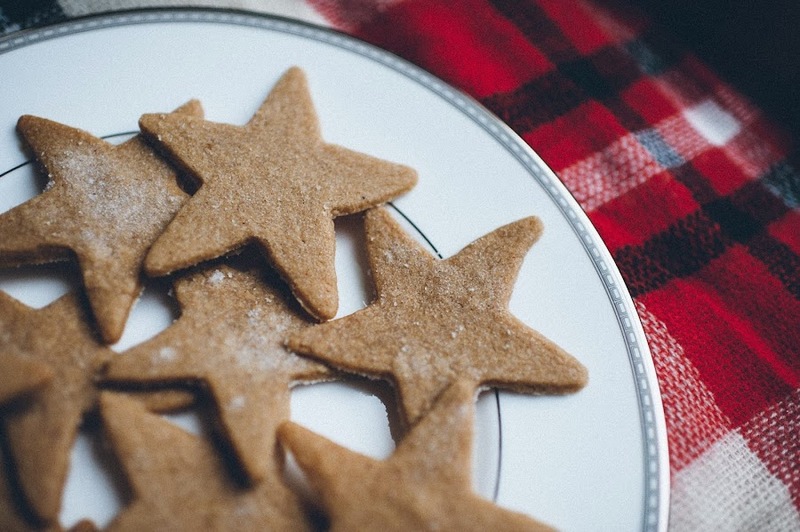 Sprinkle cookies with granulated sugar. Bake in the center of hot oven for 7-8 minutes, or until firm and just beginning to brown around the edges. Transfer to a wire rack and let cool. Store in a tightly covered container. HAPPY NEW YEAR my lovely friends! I must mention again how these go so well with tea, or as an afternoon pick-me-up. I hate that you were so sick! These cookies look like such a delightful change from all the super heavy sweets of Christmas - like a cozy cookie for January. They are perfect for January! Great with cocoa, tea, milk, hot toddies. I feel cheered by the fact that so many many others were felled by this mega virus that is Out There....misery loves company! It is so sad that you were sick over Christmas. My entire extended family has been battling this same cold since Thanksgiving - it just doesn't seem to fully clear up. In my own house the first wave hit my kids the week before Christmas, we somehow managed to be present at all the family gatherings (although I have a feeling the Christmas cookies I let my kids decorate may have infected other family members), and now we are in the second wave. The amount of draining fluids is fantastically disgusting. 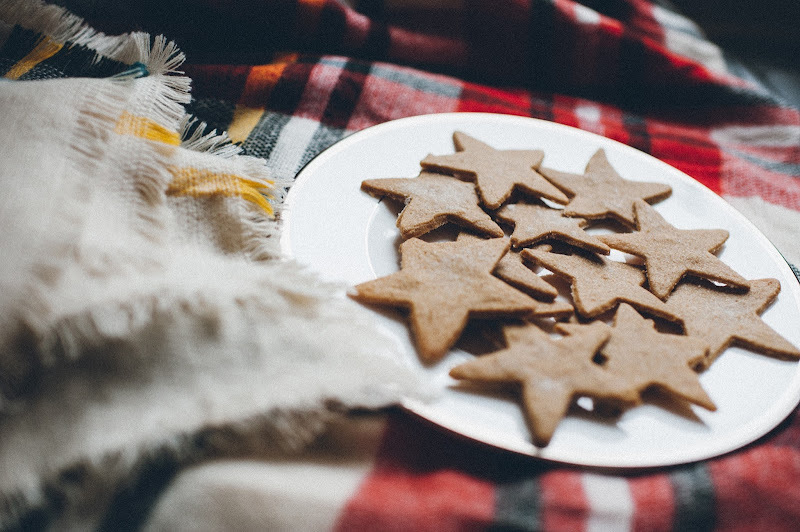 The cookies look delicious, but I have to say that the plaid blanket you used as a backdrop is what really caught my eye. So cozy looking! As I take down all my Christmas decor I am realizing that my house doesn't feel very cozy right now. I tend to be a bit of a minimalist in my style, but I feel like we might be settling into a cold, sickish winter and I am craving warmth. I might need to break out every fuzzy blanket we own and start simmering some soup! Terrible! I'm so sorry you were sick over the holiday. No, thank you! I did not do all my fave baking either. I feel ya. These look lovely and not phlegmy at all. Oh that's so interesting!! That's exactly what I kept saying to Andrew - it's a supersized cold that just went on and on but it wasn't flu level - no fever or body aches or chills. There's also apparently a near flu epidemic in our state. I would have waited until this weekend to take down the holiday stuff but we had a lot on the calendar to do that weekend so I figured I would just get it done while J was at school. I'm now decorating for 'winter' ha. I create more work for myself, but it does help keep things more cheerful looking!